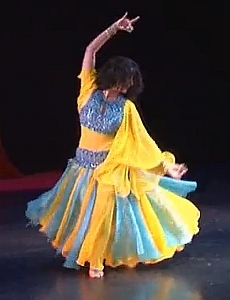 Nava Aharoni – Oriental and Persian belly dancer, choreographer and instructor. Nava Aharoni is a magnificent Israeli Oriental and Persian performer, choreographer and the director of the Sheherazade School. Nava's rich resume contains a variety of amazing productions: "Mizmar and the West", "Sapar" and "Bi-Ethnic" that had been played on the leading stages and festivals in Israel and around the globe. Nava participated in many known TV shows such as "Scent of Mint", "Taverna", "Yovel Exhibition", "the Storytellers Festival" and "the Illusions". She performed at the International Spanish guitar and Flamenco festival and with the greatest Persian singers.